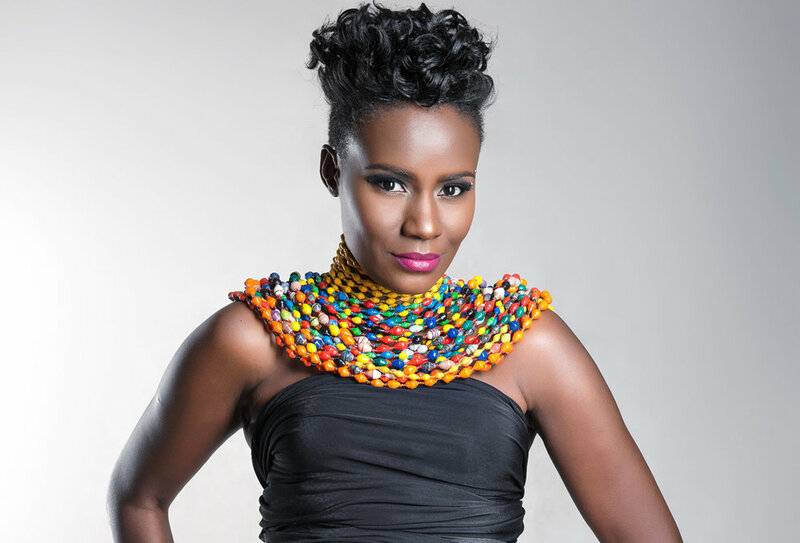 Juliana Kanyomozi is one of the most popular contemporary musical artists in East Africa today and her latest song, WOMAN could very well be the theme song of International Women's Day! When I first saw and listened to this song on Facebook, I played it over and over and over. My children are now young adults, and through my years of motherhood, my view of womanhood has changed and grown. I have a deep respect, because I've walked the path. So inspired was I by this song, I had to reach out to Juliana to get more information. I am glad I did! Aside from being extremely beautiful herself (she was named 'most stylish female celebrity 2014' at the Abryanz Style and Fashion Awards) the video shows the beauty of the many faces / facets a 'woman', and depicts her love, care, hard work and guidance - from mother, caregiver, worker, and on. It definitely speaks volumes, stirs emotions, and will warm your heart. "This song shares the pride I have for women," Juliana told me. "How they are able to triumph against many odds... and how they don't let life's struggles and adversities stop them from striving." And yes, a woman often has to fight for her rights and for her family. The female anthem is said to be her comeback song after losing her only child. "She went through a lot thinking about what to sing about most, especially after what happened to her last year. Composing a club banger was the last thing on her mind," reported UgandaOnline.com. "I'm celebrating the warrior woman," said Juliana. The music video what shot in Kampala, the capital city of Uganda the artist, who has been described as a goddess of joy by her Rwandese fans, stands proudly against a Ugandan sky at dusk wearing a stunning white gown made by designer Tina Byaruhanga. More than just a singing sensation, Juliana is actively involved in works of charity within Uganda, and is a patron of ‘I AM CHILDREN’S ORPHANAGE’, a centre for orphans located in Lungujja in Kampala. She is also a member of the Musicians Club, and is involved in activities that discover and nurture talent in Uganda, as well as being a vigilant artist on issues of copyright law in Uganda. That definitely is a warrior! Looking towards her future, the artist said, "I have plans to take my music out there to the world. I'd like to work with different artists and producers across the globe. I'm excited about my future." Her song is doing well on social media, and has surpassed a million views on Facebook after being released in early February. It can be viewed on Youtube here. "I'd like to thank everyone who has taken time to listen to WOMAN. Personally it speaks to my soul as I've been through my own share of trials, struggles and also triumphed in many things as a female artist. I hope WOMAN inspires all women out there who get to hear it," said Juliana. Juliana started professional singing in the early 2000’s. Throughout her career she has recorded ground-breaking hits that have included: Say It, Mama Mbire, Taata Wa Baana, Nabikoowa, Kibaluma, Usiende Mbali and the pivotal rendition of Philly Lutaaya’s Diana. She is the reigning East African female artist of the year 2012/2013, Best female Musician – East Africa - Kora Awards – 2012/2013, Best International Afro Beat Act – BEFTA Awards – UK – 2012/2013, Warid Woman of Substance Award – 2012/2013 for Entertainment category.